Timely. Glad to see this. Wondering about shipping to the U.S. ? It is really all down to your taste, the Zero through to the III are intended to be the full range of output that you would expect to find from a good selection of old PAF's. Being the lowest output the Zeros are indeed the brightest, stronger magnets are the easiest way to compensate for more compression and darker tones as you put more wire on the bobbin. I use 42 AWG with a thicker insulation on the PG neck pickup to help brighten it it up a little more than standard. The PG set is otherwise very similar to the the Ones. If you dont want the out of phase thing then its easy to simply not do it. So with A2 Mags you can still have bright with a little more output, just not quite as articulate and airy as the Zeros. the choice..... is completely yours but I will try to keep you on a track that will work. I should ask before I order. Are the prices per pickup? Or per set? Also, if I get covers, are they soldered or separate and I can add them later if I choose? Thanks Declan.... so we can get them uncovered and have the covers shipped with the set? Obviously, the cost will be for covered pickups. Dug around a bit for the factory specs of the pickups that came with my Bacchus. I'd forgotten that the bridge p'up magnet was ceramic while the bridge was Alnico V. Here's what they are - what is your initial impression? Wanting to brighten them up, I replaced them with Peter Florance Voodoo 60's - with an Alnico III in the neck and Alnico V in the bridge. Output on these are rated at 7.6 - 8.3K. They sound okay. Marcus, they are probably fine pickups for metal, it's an area of the spectrum.I haven't dabbled in enough as I feel much less qualified to know what is supposed to sound good. I haven't played with ceramic on lower winds at all, A8 is my current most powerful magnet and the Macha is the highest output pickup I currently wind, so wouldn't be fair for me to criticise but it sounds like you might better appreciate the brightness of a much lower wind in that guitar. Correct me.if.I am wrong, but your Bacchus is basically. 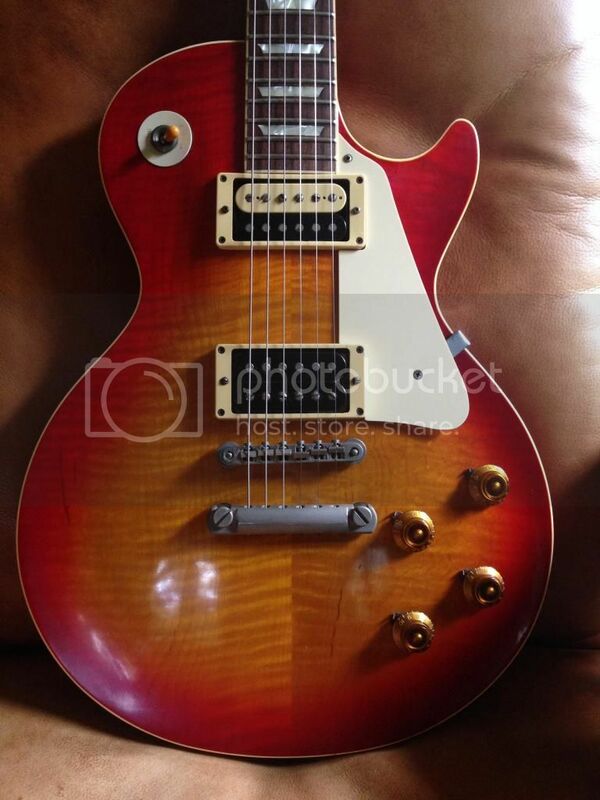 LP standard construction ? No prob sending covers separately, I'm not.going to get precious about the pickup covers being.soldered, I can send a strip of gum with them, which you can place over the bobbin if you choose to solder the covers on later. Its a simple and.effective way to avoid cover microphonics without potting them. For me it's all about clarity and musicality. If I want super hairy metal tones I will get them but with the clearest possible front end. When you start with articulation in the beginning you are always much better off and will ultimately get a better sound no matter what you are after. Providing of course you can play. With articulation comes a larger discernment of technique and musicality. Now having said that more articulation also forces you to become better. So it's a win win. The thing with these pickups is not only are they articulate but they are also musical. They capture a deeper feeling of the music for me than the Greco's. It's one thing to have it super clean and clinical but yet another to have it defined yet still musical. I have no idea how Declan did it but I can tell you one thing for sure. He dug deep. And was extremely focused. You would have to do to get this result. Obviously it's all subjective of what we like and what we expect "that sound" to be like. Myself, I'm a blues guy and I don't play with many pedals or effects (other than tremolo and reverb for my amps that don't have them). I'm looking for that open, woody, honky Les Paul tone..... here's a good example in the intro this song from the Allman Brothers' first album. Wait for the solos and you can hear both Duane and Dickey play (I still don't know who is playing which solo because there's no slide on it). One is obviously on the bridge and the other on the neck. Declan, yes the Bacchus LP is is a typical Les Paul build. One piece back, solid top. Weighs about 9 lbs. I needed a set of pickups for the solid top LS80/100/120 whatever it is. I love the Jaurez wound Seymour Duncan 59 that is in the bridge. It's sounds really crisp on chords and still meaty. Will keep that pickup for sure, but at these prices I figured I would experiment since a previous owner had already changed out the original pickups. I got a set of double cream and a set of zebras. Couldn't decide. Can't wait to get my greasy paws on them. Thanks! Yes sale prices on Deacci.com are finished( just checked)..............but.......Mr Deacci (aka Declan) in a previous post says offer will be extended to end of October..........(hopefully this is the case as I fancied a set of LP59 Two's).............can this be confirmed by the man himself?